Don't much care for 2400. I bet you mean .45-70 then. Try 14.5-15.0 gns of Unique and use a firm roll crimp. 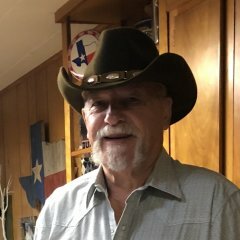 In a Marlin 1895 Cowboy I shoot long range out to 200 yards with 13 grains of Trail Boss under a 405 grain lead bullet. My 405gr load was 34gr of 2207 (H4198). That is a bit quicker than the TB load above (about 1450fps V's 1000fps for the TB load). Both loads are good for your stated range and rifle. I use 27 grs. Hodgdon 4198 behind 405 lead bullet, mild recoil, accurate at 200yds. 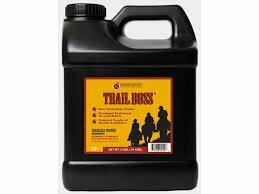 Trailboss is a good powder for the 45/70, really low recoil, don't quote me, I thought I used 16grs. behind 405.
for my Marlin 95 14.2 Unique with a 340 grn bullet. Have SUCCESSFULLY shot it out to 300 meters. 60 grains of GOEX FF, Fed 215 primer and one milk carton wad under a 405 lead bullet. Tune it to your taste and have fun. Best load that I have shot at 200 for ringing steel. Haven't tried it for punching paper. 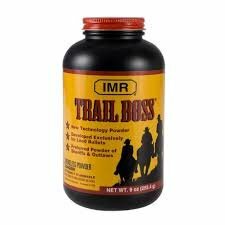 I've noticed folks using X amount of H4198, however my books call for IMR-4198 which I believe is a completely different powder. Any info here? 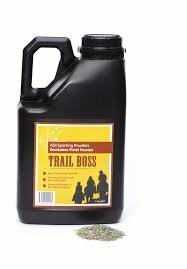 I use trailboss for 1895 marlin. 13 grains will wirk. H4198 is actually made in Australia and we call it 2207. TB is made in Australia and sold to Hodgdon by ADI (Australian Defence Industries). These containers are IMR, ADI and Hodgdon. I don't think they would get away with the same image unless they were under licence from one supplier,. I'm only just starting to learn about reloading, but I recently had a similar question. The answer was to look in different books. Some books just don't cover certain powders. Do the 405 Bullets have a single grease groove or triple? What is the overall length of the final product? In every case the powders are not interchangeable even though they are now all made by Hodgdon. IMR and Accurate also share numbers between several powders and they are not interchangeable either. I thought Hodgdon didn't make powder but were a bulk buyer and distributor? Link is to an article which includes the powders from Aust and what Hodgdon calls them. Most likely the same parent Co. owns all three. ADI (Australian Defence Industries) was an Australian Company that started as an Aust Govt entity. It is now a subsidiary of Thales which is a French company. Are IMR and Hodgdon French owned?